It's Saturday and I have no motivation. Just getting to work and then home again with Chipotle in my hand will be about the limit of my energy today. I'm deep into research for my NaNo since my planned novel is historical in nature and I'll be ordering maps of the area on Monday to post around my room for a few months. My poor DH will have county maps to look at for good or for bad. I need pretty things today, so I'm going to focus on fountains. 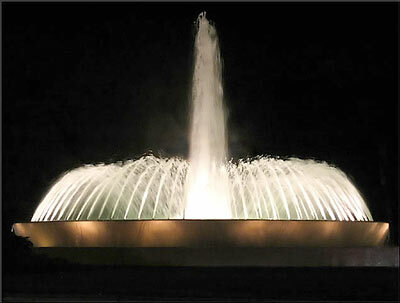 No following text, but several pics of wonderful fountains to make your weekend start off well. traditional fountain, but strikingly beautiful. 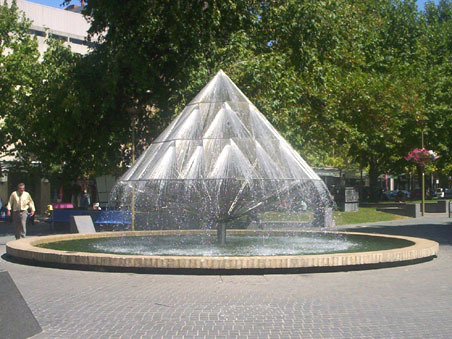 This lovely cone fountain is in Canberra, Australia. in Saudi Arabia. 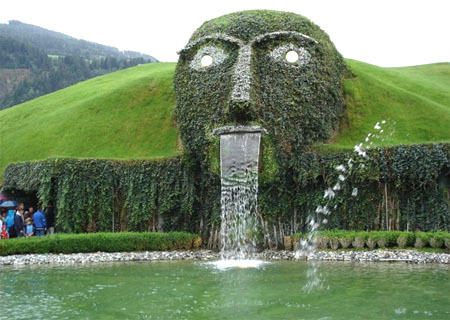 I love the form of this fountain. in the world, but this pic looked so refreshing. I hope you enjoyed your tour through some fountains. Monday we'll return to thoughts, worries, plans and pratfalls. Have a phenomenal weekend! Current Location: I'm cold and I need a good cuddle. I love the first especially. My favourite fountain was a dandelion one in Edinburgh that we saw on our honeymoon - then we went back and it wasn't there any more - I was very sad. I love dandelion fountains, but I had a really nice cluster one in my last fountain post a few months ago so went for a different shaping this time. What a bummer that your Edinburgh fountain wasn't there when you returned to the city. Oooh, I'll have to search online and see if I can see the St Petersburg fountains. 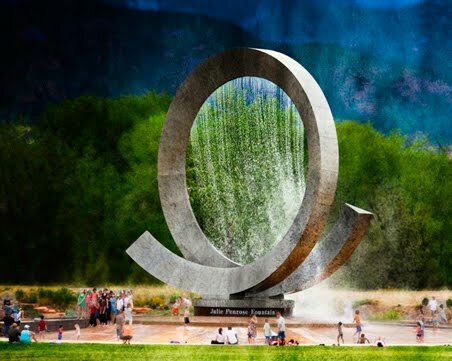 I love "surprise" fountains - they are just a fun, fun concept. Wonderful pics! 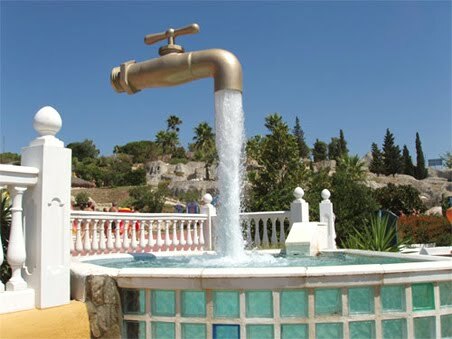 I'd love to see that 'magic tap' fountain (or one like it) in person. There are several of these throughout the world. The water source is hidden in the downflow. They are really quite fun and the look on children's (or hobbit's) faces when they first see them is precious. Thank you, my friend. It's the 25th. But they're actually difficult to take a picture of or even a video. Yay, another of your fountain pic posts. I love the shape of the second-to-last one also. 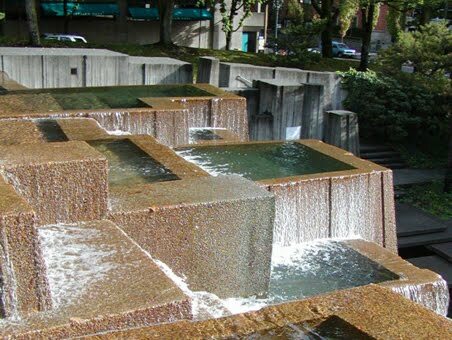 And I really need to go to Portland sometime, for many reasons, but clearly that fountain is one of them. A not-quite-fountain dragon to watch over the rest of your day. Oh, he's truly lovely. I think I need to write about him...I have the perfect story in mind. May I borrow him? Portland is one of my favorite cities. I used to be there every year for a convention for almost five years and I fell in love with the place. If it wasn't on the NW coast and rainy so much of the year... But I really loved visiting it and would go again in a flash. Thanks. 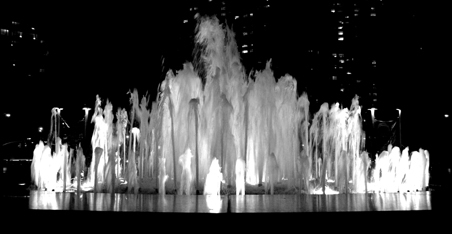 I love water of all sorts and fountains are simply magical to me.